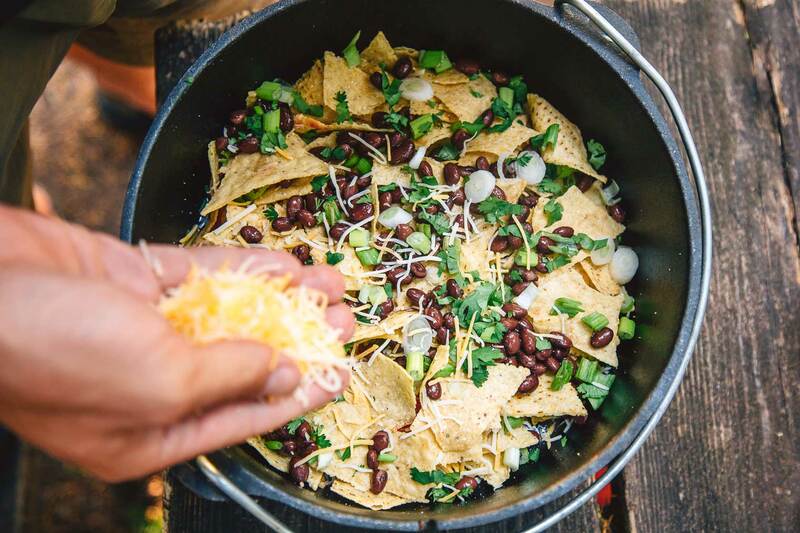 If you’re going to eat nachos for dinner (an act which we fully endorse), then you’ve got the build the meal properly from the ground up. Think of the chips as the bricks and the cheese and toppings as the mortar. One layer of chips followed by one layer of cheese and toppings. Then, repeat. Keep stacking the layers like that until the pot is filled or you run out of supplies. And of course, every good house needs a roof, so make sure you give a double helping to the top layer. Place over heat, pour yourself a drink, and when you get back you’ll have a Happy Hour appetizer that’s worthy of being called dinner. Hands down, the most versatile piece of camp cookware we own is a Dutch oven. 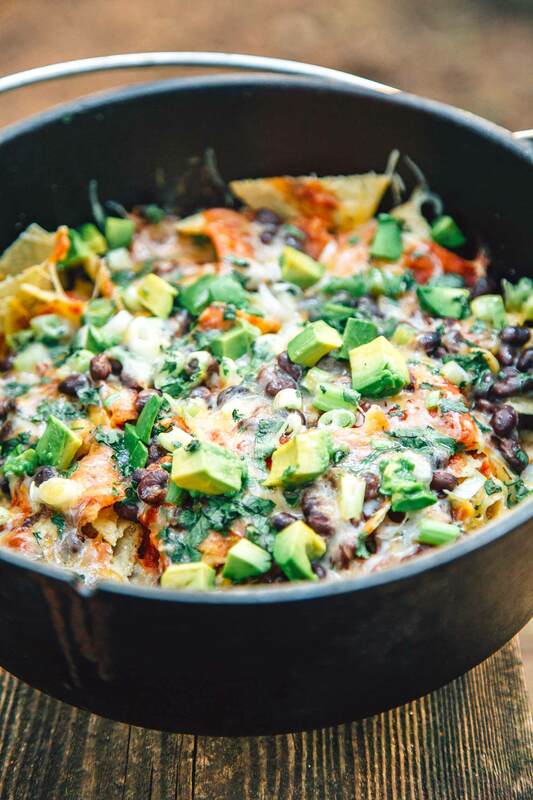 This piece of equipment opens up a whole new world of cooking options: you can cook stews, bake lasagna, braise chicken, and of course, make these nachos! It can be used on a camp stove or directly over the fire. The short legs and rimmed lid allow you to place embers/coals on top as well as underneath, cooking your meal from both directions. We have this Lodge version which can be found on Amazon or at REI, but the next one we buy will be this Barebones Dutch oven. The unique lid design allows you to control the steam inside, making it perfect for baking things like pizza! 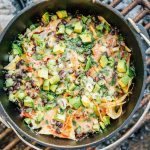 We used this recipe primitive camping in July. It was amazing. We used a deep square foil roasting pan. It took less time to heat but nothing burned. My kids and husband devoured it. We will def be making this again. Made this on our camping trip. Super easy and very tasty! Will be doing it again! This was delicious! I added some grilled chicken breast meat. Served with salsa and guacamole. Thanks for the recipe! This looks simple.. we are going camping this weekend and looking forward to trying this. I hope I don’t mess it up. its the first time I will actually have to prepare something thats not burger s and hotdogs for a camping meal…. Oh boy, that’s not good. Without knowing your exact setup, here are some thoughts: 1.) Possibly too high of heat. Campfires can get super hot, so even if it wasn’t directly over the flames it might have been too warm – especially if you experienced burnt edges. 2.) Did you have any sort of liquid in the pot? Something like salsa / el pato tomato sauce? The liquid turns to steam when heated, which rapidly melts the cheese, and gives you a little buffer before things start to burn. Shoot us an email, if you want to discuss at greater length. Looks delicious! Would love to try on our camping trip this weekend. Just wondering, will the chips get soggy? The chips will get slightly steamed while melting the cheese, but they shouldn’t be soggy. wow, doing last minute so-tired-of usual meal planning for camping trip this week… love your one pot concept. Excited to build nachos. taking our 4 year old granddaughter; this will be a hit. The Nachos were a hit. Used the Dutch oven. Did some variations. We had lots of leftovers and they were yummy reheated over a.m. campfire (decadent) with eggs and coffee on the side. I think next time we might use the crispy whole round tortillas instead of corn chips. Used more cilantro. 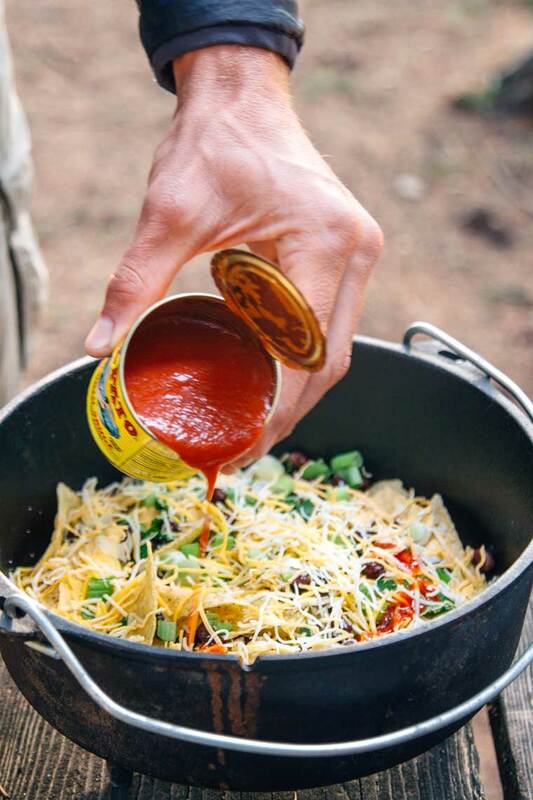 This is a keeper idea/recipe for camping! This looks so fabulous! You guys are so creative. 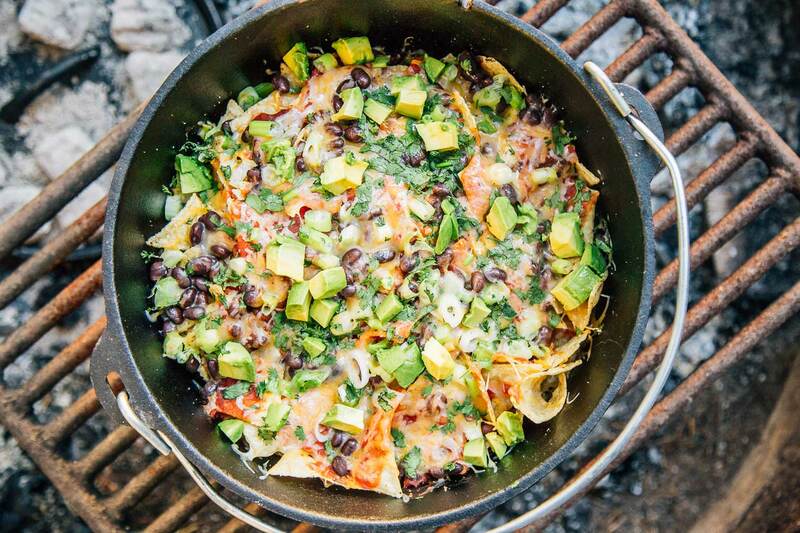 I never thought of making nachos on a camping trip!! Omg. Stop. Seriously guys. This looks ALMOST as good as Carl’s Jr. Almost. Love the idea for our next camping trip. Appreciate the recipe and the tips shared. Great content and guides here, my wife loves this stuff too and will be reading more. Thanks. 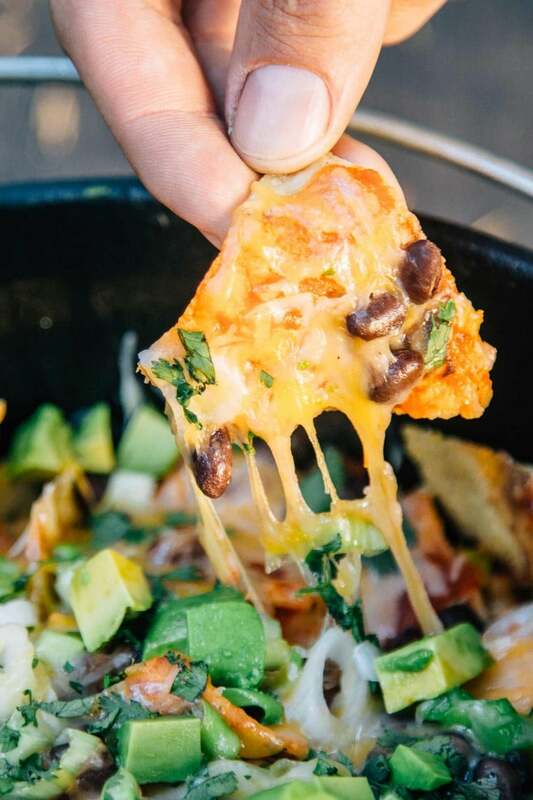 That looks amazing, I have never even thought of cooking campfire nachos. I usually just stuff mt face with a packet of doritos and eat a can of baked beans.